As T-Mobile’s LTE network continues to roll out in large swaths, so does our wish to use it to its full potential. It’s also true that with the addition of mobile hotspots into just about every smartphone under the sun these days our need for independent mobile hotspot devices wanes a little, but that doesn’t end the need completely. 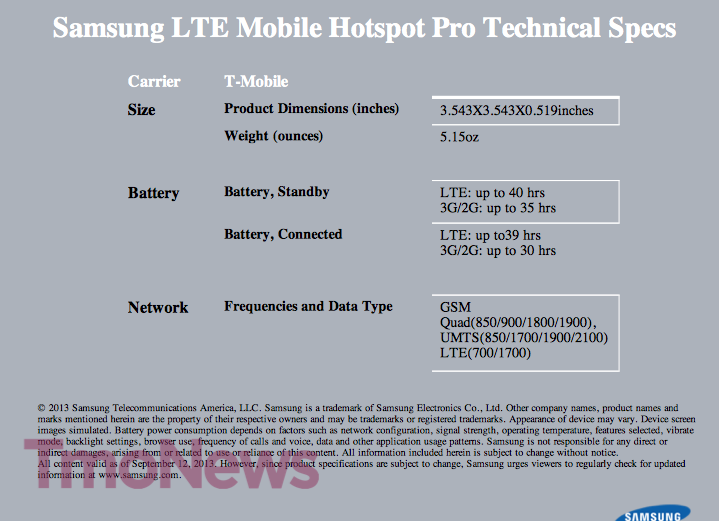 Thanks to a pair of shots captured from a Samsung training manual, we’re getting our first look at an upcoming T-Mobile branded LTE Mobile Hotspot. The specs are pretty standard for a hotspot and there’s no “wow” factor here and it won’t do your laundry or cook you dinner. It will however last up to 39 hours when connected to LTE or 30 hours when connected to 3G/2G. When you ask why there are still Mobile Hotspots on retail shelves, that battery life is one of the biggest reasons. Given how much of a battery drain a mobile hotspot connection can be on your smartphone, this image and the battery life should be reason enough to shell out some cash once this hotspot arrives. T-Mobile now sells the Sonic 2.0 Mobile HotSpot LTE, their first such LTE hotspot. It currently sells for $29 down and $5 per month or $149.99 outright. 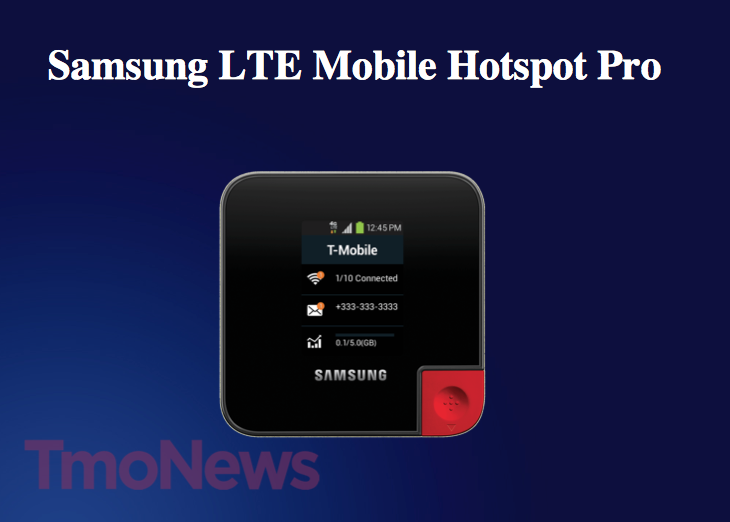 I expect that the Samsung hotspot will be similarly priced when it arrives. Any unlimited data plan to support it? wireless companies will never try to compete with home internet service. The wireless infrastructure cannot support that much usage. They very nearly are in my case, in terms of amount of usage. I use Google Play All Access and have a large collection of “thumbed up” songs. I also flash new roms on my device frequently. 3 or so a week. GPMAA automatically generates a playlist for the songs you’ve thumbed up, and I mark this playlist for offline access so I can listen to it on the road. The playlist is currently just under 10GB. This alone accounts for around 30GB a week for one portion of data for one line for one user in a family of 5. Yeah, I do anywhere between 60-70gb each on 2 lines. I love T-mobile unlimited. Lovin’ it. So glad I left Verizon. I was on their “unlimited” (grandfathered), but it did me little good considering their service in my area had become “spotty” at best over the last two years. The limit is 9.9Tera, so relax. My max at one point is 200GB, one person did go beyond 1Tera before. What a waste of data. SMH. I’m sorry but anyone that does stuff like this is just ignorant and rude. Is there really a need to hog up all that bandwidth just so you can flash 3 times a week? I can’t imagine all the strain your putting on your phone either. Downloading all that has got to make your phone pretty hot for extended periods of time. Not good. Couldn’t you just download it all to your SD and save the other 100gb/month for the rest of us? You’re probably the same guy that needs a 3 inch stack of napkins to eat a grilled cheese sandwich. In the future, please do not attempt to criticize anyone based on subjects you obviously know nothing about. No; don’t try and defend it. The statement above proves it beyond any doubt. Don’t make it worse by digging yourself in deeper. Please know: My usage doesn’t affect your ability to download as much or as little as you want in any way shape or form. The rest of your statements are just as misinformed. Do not take that as an insult, but rather as some information to help you be better informed for future posts. What are you talking about, both ATT and Verizon offer wireless home internet service (10, 20, and 30gb capped service in select markets). As demand increases you will see wireless home internet because it is easier to deploy in rural markets and is faster than satelite/dsl service. See Verizon Home Fusion. As you metioned, these plans have usage limit, but the person above wants unlimited internet. I would be interested if there’s ethernet socket. Hopefully it’s not nanosim required. T-Mobile has ONE LTE HotSpot. C’mon now. It would be shameful NOT to cover this. I didn’t say they’d replace it, but it would be good to complement it. I don’t trust ZTE, as they have shoddy security and as it is have already admitted to engineering in backdoors to their products (on MetroPCS, as ironic as that is). I would pay up to $90 more to buy a non-Chinese product that offers tethering capability if I needed such a device. Unfortunately. I wish I did trust ZTE more. Battery life on this device is better than my Sonic 2.0 which only gets 10 hours of straight use. Hopefully TMO revamps the MBB plan with more data for less. this thing has LTE 700 maybe T-Mobile will start using 700 MHz for their LTE. Not a chance. AT&T and Verizon bought most of that spectrum. They are just preparing devices for the eventual LTE roaming agreement with AT&T or Verizon. I used hotspot with my HTC One today on LTE and wow, browsing the web was a breeze. Couldn’t believe how up to the task it was. This might be a consideration for my office. Is anyone else confused on how LTE gets better battery life than 3G/2G??? I’m also wondering why the standby time is so short. Previous hotspots get 100 or more hours of standby. Seems thick like the Sonic 2.0. Any rumors of new prepaid hotspot plans? Anyone know if the prepaid T-Mobile hotspots from Walmart will be updated to LTE versions? Probably not, as to my knowledge they don’t have an LTE-compatible radio. I think he meant if Walmart will carry T-Mobile LTE hotspots compatible with the 60 day prepaid cards. Using a USB stick or hotspot not from Walmart will get the normal 30 days.